Deep-sea explorers who found $500 million in sunken treasure two years ago say they have discovered another prized shipwreck: A legendary British man-of-war that sank in the English Channel 264 years ago. The wreckage of the HMS Victory, found below about 330 feet of water, may carry an even bigger jackpot. Research indicates the ship was carrying 4 tons of gold coins when it sank in storm, said Greg Stemm, co-founder of Odyssey Marine Exploration, ahead of a Monday news conference in London. 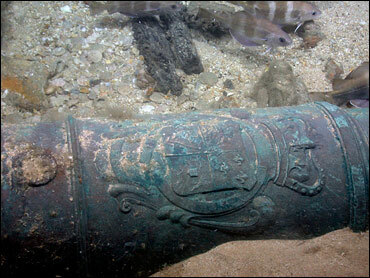 So far, two brass cannons have been recovered from the wreck, Stemm said. The Florida-based company said it is negotiating with the British government over collaborating on the project. "This is a big one, just because of the history," Stemm said. "Very rarely do you solve an age-old mystery like this." Thirty-one brass cannons and other evidence on the wreck allowed definitive identification of the HMS Victory, 175-foot sailing ship that was separated from its fleet and sank in the English Channel on Oct. 4, 1744, with at least 900 men aboard, the company said. The ship was the largest and, with 110 brass cannons, the most heavily armed vessel of its day. It was the inspiration for the HMS Victory famously commanded by Adm. Horatio Nelson decades later. Odyssey was searching for other valuable shipwrecks in the English Channel when it came across the Victory. Stemm wouldn't say exactly where the ship was found for fear of attracting plunderers, though he said it wasn't close to where it was expected. "We found this more than 50 miles from where anybody would have thought it went down," Stemm said. Federal court records filed by Odyssey in Tampa seeking the exclusive salvage rights said the site is 25 miles to 40 miles from the English coast, outside of its territorial waters. A Ministry of Defense spokesman said Sunday the government was aware of Odyssey's claim to have found the Victory. "Assuming the wreck is indeed that of a British warship, her remains are sovereign immune," he said on condition of anonymity in keeping with government policy. "This means that no intrusive action may be taken without the express consent of the United Kingdom." He would not say whether the government had begun talks with Odyssey over the future of the find. Newspapers of the day and other historical records analyzed by the company indicated that the Victory sank off the Channel Island of Alderney near Cherbourg, France. A 1991 British postage stamp depicts the Victory crashing on the rocks there. Pieces of the ship had washed up in various places, but its final resting place remained a mystery. The belief that the Victory had crashed onto the rocks had marred an otherwise exemplary service record of the ship's commander, Sir John Balchin, and a lighthouse keeper on Alderney was prosecuted for failing to keep the light on. Odyssey believes the discovery exonerates both men. "As far as the family is concerned, it is an astonishing revelation," said Robert Balchin, a 66-year-old British university administrator and direct descendant of the commander. "It's as if he's sort of come alive again. "When I went to see this extraordinary find of the cannon with the coat of arms of the king on the side, it was really a wonderful feeling to know that Sir John Balchin saw that every day, and it brought a very special communion with the past." The HMS Victory was returning from Lisbon, Portugal, and was probably transporting 100,000 gold Portuguese coins for merchants, according to Odyssey's research. The ship had sailed there to help rescue a Mediterranean convoy blockaded by the French in the River Tagus at Lisbon. The wreck site is roughly 70 feet by 200 feet and littered with other debris, Odyssey said. Its research ship, Odyssey Explorer, is equipped with a remote underwater robot capable of carefully removing the smallest of items from the bottom and shooting high-resolution photos and video. The company's work on the Victory is the subject of an upcoming Discovery Channel TV show. Odyssey, a publicly traded corporation, announced in May 2007 that it had raised 17 tons of silver coins from an Atlantic Ocean shipwreck. The company later said it believed the wreck to be the Spanish galleon Nuestra Senora de las Mercedes y las Animas, which sank off Portugal in 1804. Shortly afterward, the Spanish government sued Odyssey in federal court in Tampa to claim the treasure, arguing that the shipwreck was never abandoned by Spain. The case is pending. Some in the Spanish government have called the company 21st century pirates, and twice in the months after the 2007 announcement, ships from Spain's Civil Guard seized Odyssey ships off the Spanish coast. Both ships and their crews were released within a week. The company's relationship with the British government has been more cordial. Odyssey had already negotiated an agreement with British officials regarding the search for the HMS Sussex, which sank in the western Mediterranean in 1694 with gold coins aboard.